Welcome to Windsor Interfaces, developers of FREE innovative software you can use. Bringing the information you care about to you fast and easily, your computer becomes natural like never before. 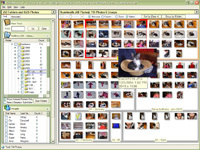 We offer Zoomable User Interfaces (ZUIs) in PhotoMesa and DateLens. ZUIs offer an intuitive way of managing more information than fits on the screen. You zoom out for context, and zoom in for more detail. ZUIs enable you to work with more information at a time, and you spend less time navigating to find what you want. NoteLens™, PhotoMesa™ and DateLens™ are now available completely for FREE! Why free? "PhotoMesa is flexible and original. It's much easier to annotate and find photos that contain images of a particular person than other organizers I've seen." "It's no wonder that Windsor Interfaces is named Windsor Interfaces. Interfaces is clearly what they do best. They have managed to make a piece of software that behaves rather unlike any I've seen before, yet made me feel right at home using it instantly." Copyright (C) 2006 Windsor Interfaces, Inc.
Find as you type - fast!